But thanks to all who saw the film, bought the book, watched the motion-comics, listened to my rants, and wrote so many nice emails -- it's always, always appreciated, and I'm glad y'all dug the work. So on request from a fan (thanks, Emily!) 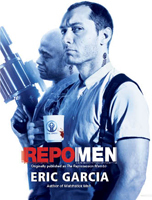 I've decided to upload THE TELLTALE PANCREAS, the original short story that led to The Repossession Mambo novel and eventually to Repo Men the film. Up 'til now, it had only been seen by a small group of people -- my agents, SFX guru and director Bob Kurtzman (hi, Bob! ), a bunch of friends, and some editors at a few magazines who rejected it, damn them. Please keep in mind it was written just a couple years after I got out of college -- I was but a babe of 25 -- so if the style isn't up to snuff, apologies. One of these days -- well, probably in a couple weeks -- I'll stop babbling about REPO MEN and choose a new topic, but for now, Repo's on the menu. To wit, we just released the first motion comic meant to introduce you to the world of the film, and to our main character, played by Jude Law. Jude reprises his role from the film here in the motion comic, which was directed by Miguel, and co-written by yours truly. As with the film itself, it's R-rated, so please, kids, cover your eyes at the naughty bits. A little Fango in your life? Miguel's cut of his own redband trailer has just been put out by Universal, and it's my favorite so far, hands-down. Mig's always had an AMAZING sense of music in film -- wait'll you see what he does in the actual movie with 'source' clips -- and this trailer is a perfect example. Warning: This one's a bit bloody. I know, they all are, but redband is redband for a reason. The posters just keep on comin'! For your viewing (and possibly obsessing) pleasure, presented below is the video for "Zef Side/Beat Boy" from the Afrikaaner hiphop/rap/something group Die Antwoord (rated R for language, kiddies). Those of you who know me well know this is certainly NOT up my usual alley -- I'm not the hiphop kinda guy, but I'm fascinated by Die Antwoord. I won't go into all the specifics about who/why/what they are; best to just watch it clean, as I and the rest of the internet did a week ago when it all blew up. I originally found them via Boingboing, and you can get the lowdown on the group via boingboing HERE. They do, really! They want to help. They swear it.